In the 21st century, beauty will no longer save the world. It has been replaced by the force which is twice more powerful, tremendous and explosive: creativity. Though being creative is unbelievably tough, there are some tools that hearten your inspiration. DesignContest wants you to meet 6 apps for creative professionals. Behance is a place where inspiration lives. It would be amazing if we had a bit of this inspiring nook in our pockets, carrying it with us everywhere we go. Behance picked up this idea and created a mobile app that shares its inspiring ideas with us. Behance turned out to be not only a profile website (though design projects still are the fundamental ones). It also is a magic well for billions of ideas. Looking at amazing ads and branding concepts, you’ll get assured that your branding campaign can be the same. Or even better. That whirl of fresh ideas will catch you for good. What is the main drawback of creative people? They are messy. They can never find what they need and their brilliant ideas remind a bit of a tangled skein. That is when Evernote comes in handy. It helps you to remember everything you need and makes sure you won’t forget any amazing idea that comes up to you. Evernote is a cure for that mess and is prescribed for those who are afraid to lose their creativity flow of a daily routine. This ingenious mobile app saves lots of your time while creating vector images without using Adobe Illustrator. Almost 200 basic shapes can be stuck together so that you could make designs of any size. It is really convenient to have it on your tap or smartphone, as well as such tool has to be always on hand. A building block approach might sound simple but its implementation is really worth our admiration. So, if you need something flat and speedy for your creative imagery, you have found a right application. What are the main perks that all those moodboards and inspiration boards have? Except for containing various ideas, they also play an important role in their visualization which brings even more creative ideas. 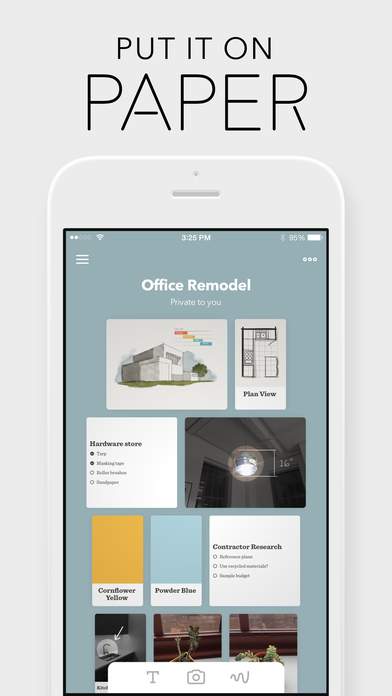 Clarifying details in photos, creating lists, notes, and other necessary stuff are those functions that make you want to download the app. Its constant upgrades and interface design are those features that make you want to use the app. Again and again. Cool and unusual photo collages of various shapes and sizes, containing different effects and captions – that what makes Fuzel so engaging. Along with its UI design, for you will hardly find anything more stylish and trendy. A wide range of functions that include resizing, cropping and filters enable you to change photos the way you want is a pleasant bonus. You may add as many photos as you want, using different sources (including social media) to get them, which makes the final result even more creative. If you have a Facebook community and want to fill it with an original content created by yourself, make sure you know what PicLab Studio. Despite the fact it is not free of charge (though the fee is reasonable), PicLab Studio has been considered one of the most popular apps that help people to fill the Internet with beautiful images that contain inspiring quotations that awake our inner desire to change the world by changing ourselves. PicLab Studio guarantees the content you provide belongs only to you; it secures your corporate style and, therefore, develops your brand. All is fair in love, war, and struggle for creativity. Using at least one app of those mentioned above will facilitate this race we take up every day, trying to be as creative as it is possible and even more. If art, freedom, and creativity are changing our society, they are certainly doing it with the help of these apps. Do you use them? Let us know in the comments below!